If you’ve activated any add-ons in your account, such as “Webforms” or “Social Links” or “Promotion Tweaks”, you can always access the settings for each one, right from your dashboard. Simply click on any of those white add-on links, in the top right of the page. If you want to activate any of our neat add-ons, just click on “Add things” at the very top of any Mimi screen. Or you can click on that white “+” on the far right of your add-ons links. In the large, center section of your dashboard, you’ll see a thumbnail and summary representing each one of your newsletters. If you click on that thumbnail, you can preview the promotion, as it is. To the right of that thumbnail, is a stats summary. These numbers and the pie chart are showing total stats for that newsletter, including every time it was sent. If you click on any of those metrics, then you’ll get to the overall mailing stats for that promotion. In order to see the stats page for the latest mailing, just click on the “Stats” button, below the thumbnail. You can refresh your stats for any promotion, at any time, by clicking on the little circular arrow button, next to the “Stats” button, underneath the promotion thumbnail. Your stats display will be unavailable while Mimi refreshes these statistics. Read more about your email statistics. Edit: You can open this promotion for editing by clicking on the “Edit” button, underneath the thumbnail. Send: And you can send the promotion, from right here on the Dashboard, by clicking the “Send” button, next to that. Schedule: Click the clock button to schedule the promotion, for sending at some time in the future. It will turn red when you’ve successfully scheduled your promotion. And you can click that red clock to view upcoming scheduled sends, or to edit any existing schedules. Clone: The sheep button will “clone” a promotion, making a copy of that promotion, above it, on your dashboard. Mimi will add an incremented number to the promotion title, so you can tell which copy is the clone. You’ll also see a little sheep icon in the top right of the promotion tile, so you know that it’s a copy. 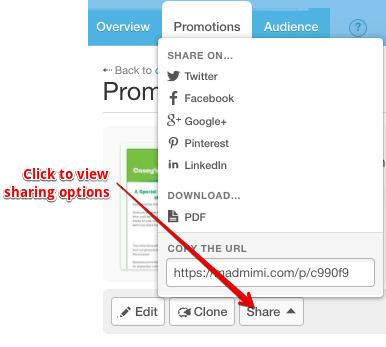 Share: When you click on the “Share” button, you’ll see a list of social platforms, and the mad.ly URL for that promotion. If you’ve enabled the social sharing buttons in the email, then you can click on any of these to directly share the newsletter on any of those networks. Or you can copy the mad.ly URL and share that anywhere you’d like. Delete: If you want to delete the promotion, just click on the trashcan button, all the way over on the right of the promotion tile. If you click on any promotion on this sidebar, then they will show up to the left, in the main area of the page. They will display in the same order they are listed in the sidebar. 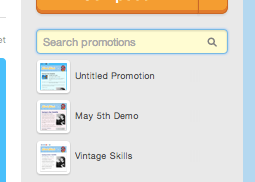 You will also see them added to a new list, at the bottom, showing you which promotions are selected. If you look to the right of your Dashboard, you’ll see a grey panel with teeny tiny thumbnails, and titles, of all your promotions. This is a big list of all the promotions that exist in your account. This is how you can view those on other pages, if you have many promotions. Older newsletters might not automatically show up in your “Recent” listing that is large, in the middle. You can click on a specific page to jump to it, or you can browse through the pages using the little arrows. If you want to consolidate any of your promotions into a single group, you can do that here, too. Drag any teeny tiny promotion thumbnail, on the right, on top of any other teeny tiny thumbnail, and let go. Voila! A group. Mimi will give you the opportunity to name this folder, right when you first create it. You can also edit the name of this group, at any time, by clicking on the pencil icon, next to the group name. If you want to remove a promotion from this group, just drag a promotion from inside, to outside the folder, and Mimi will remove it. If you only have 2 emails in a folder, and you drag one of them out, Mimi will automatically remove the group, altogether. Next to the group, you’ll see a badge with a number – sometimes two. The single number shows you how many promotions you have put into this group. And if you have any promotions in the group selected, the number will change to indicate that. Read more about grouping newsletters into folders. You can also use this area to search through all of your promotions. Simply type your query into the search bar, at right — Mimi will automatically begin searching your newsletters, when you enter text in this field. Your search results will display in that grey panel, in a list. You can click on the thumbnail to pin it to your large, center dashboard list. Now that we’ve come to the end of our crash course in your Mad Mimi Dashboard, get out there and get emailing!